The Football Ferns have fallen 3-1 to a classy Japan side on a record-breaking evening at Westpac Stadium in Wellington. At the end of a week in which Football Ferns fever swept across the capital, the notorious Wellington winter weather had threatened to spoil the party but match day brought fine conditions with no rain and hardly any hint of the city’s characteristic wind. The football folk of Wellington responded to the favourable conditions by turning out in their droves. The official attendance figure was 7,236 – smashing the previous record for a Football Ferns game, set in 2007 at Auckland’s QBE Stadium against Canada. But it appeared as if they might not have much to cheer in the opening stages as Japan lived up to their billing as one of the world’s best teams. The visitors dominated possession early on and earned the reward their bright start had deserved in the 17th minute, albeit via a touch of good fortune. The dangerous Mina Tanaka fired off a shot under pressure inside the New Zealand box and it struck the leg of the unfortunate Meikayla Moore to deflect over a stranded Erin Nayler. The Football Ferns, captained by Amber Hearn in the injury-enforced absence of regular skipper Ali Riley, responded immediately to that setback though and had the record crowd on their feet just seconds later. A corner from Rosie White caused all sorts of problems for Japan as they failed to clear and Moore took full advantage by smashing in her first international goal. Buoyed by drawing level and with the vociferous crowd roaring them on, New Zealand then enjoyed one of their best periods in the game. They forced a couple of corners in quick succession and again caused panic in the Japan box while Hannah Wilkinson and Sarah Gregorius both found space out wide but couldn’t pick out team mates with their crosses. After that spell of New Zealand pressure, Japan again began to dominate the ball but the hosts’ defence held firm. That defensive line-up was of the new-look variety with debutant Sarah Morton replacing Riley at left full back while Stephanie Skilton – recently converted from a striker – slotted in next to Moore and Rebekah Stott in a middle three. CJ Bott was at right fullback and had a strong first half, using her physicality to good effect defensively and pushing forward at opportune times. 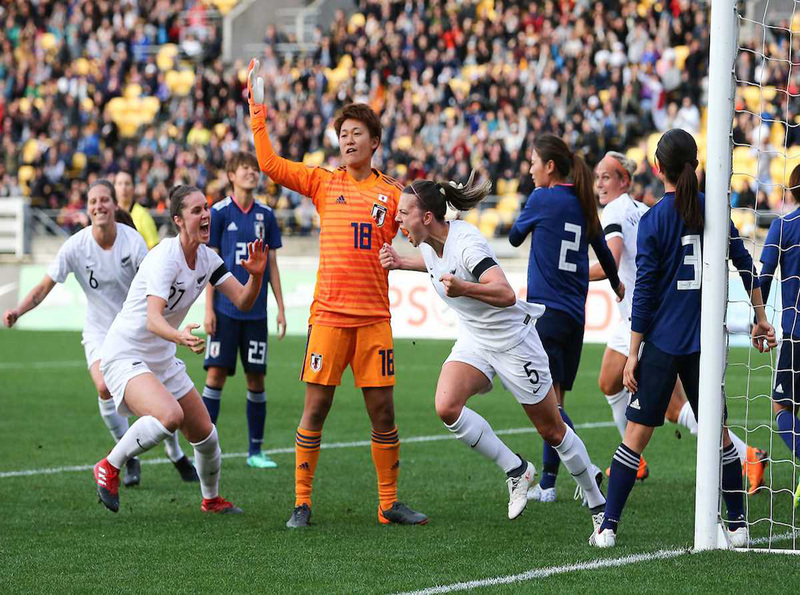 The class of Japan could not continue to be denied though and they were back in front on 34 minutes, Tanaka scoring her second with a composed dink over Nayler from close range. It proved to be a memorable night for Tanaka as she completed her hat-trick just before the break, expertly tucking away a header from a perfectly-placed cross. That gave Japan a 3-1 lead at the break and it was always going to be difficult for New Zealand to claw their way back from a two-goal deficit against a side of such high standing. Coach Andreas Heraf turned to the bench at half-time, bringing on Katie Bowen in place on Betsy Hassett in the middle of the park and continued to make full use of his substitutes later in the half. Annalie Longo, Paige Satchell and Emma Rolston all entered the fray as New Zealand searched for a way back into the contest while youngsters Liz Anton and Malia Steinmetz also received game time late on. But further goals could not be found as the Football Ferns had to be content with restricting the 2011 FIFA Women’s World Cup champions to a scoreless second half.